Agriculture is one of the leading causes of pollution in the Chesapeake Bay Watershed, a sprawling system of rivers that congregate in one shallow tidal basin. Commercial fertilizers and manure applied by farmers to their fields can run into streams and rivers, eventually making their way into the Bay. Chemicals like nitrogen and phosphorus are found in these fertilizers, which can negatively impact the water quality of the Bay by promoting eutrophication which can lead to massive algal blooms which in the end leads to decreased soil oxygen, reduced sun exposure, and the death of the flora and fauna that live in the bay and our rivers. In 2016 for example, 20% of the fish kills in the bay were caused by low dissolved oxygen levels (MDE). Our proximity to the Bay makes proper management of our land critical to the health of our natural ecosystems. 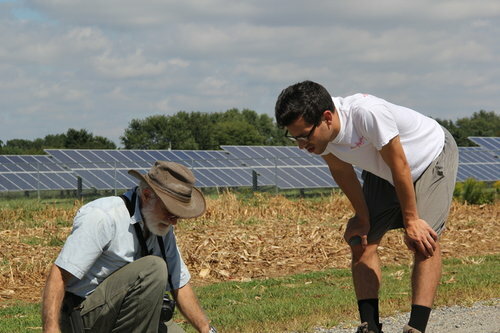 At Harborview Farms, we protect the Chesapeake Bay not only by limiting inputs and monitoring fields, but by actively collaborating with various environmental agencies, soil health experts, and researchers to keep them informed of our conservation efforts and to learn how we can better conserve the environment. "At the Chesapeake Bay Foundation, we often say a well-managed farm is the best land use that we can have in the bay watershed, and I think that [Harborview Farms] exemplifies that." There are two main organizations that we partner with. The Chesapeake Bay Foundation and the Shore Rivers Association. The Chesapeake Bay Foundation's mission is to save the Bay, and keep it saved. In terms of agriculture, the CBF continues to advocate for conservation programs to establish on-the-ground projects that limit polluting runoff: stream buffers, cover crops, rotational grazing, and other conservation practices. The Board of the CBF has visited Harborview to observe our conservation efforts, and the CBF helps provide funding for some of our cover crops. ShoreRivers is a non-profit organization that was first formed in 2017 when several local river associations merged. It aims to improve the health of Eastern Shore Waterways such as the Chester, Choptank, Sassafras, Miles, and Wye Rivers through a science-based combination of advocacy, restoration, and advocacy. Trends in water quality and pollution sources are tracked at nearly 200 stations to optimize restoration efforts. This data is also used to advocate for strong water quality laws. ShoreRivers also works closely with students and teachers to educate them about the importance of waterway health. Additionally, ShoreRivers works jointly with farmers to solve problems relating to nutrient and sediment loss by developing and testing new technologies that are beneficial for farmers and our waterways including nutrient-removing bioreactors, buffer zones, and encouraging the development of native wetlands.